This couple needed help with furniture placement, paint colour, furnishings and accessories. They had been renovating their home intermittently for 7 years and ran out of steam and inspiration for the final push. The husband had a keen interest in, and knowledge of designer furniture, but needed guidance with scale and proportion, and his wife wanted an atmosphere of warmth and character in their home. The living room was bare, except for two temporary garden chairs. The dining room table had been purchased a number of years prior, and the client wanted us to work with it when adding new items. The master bedroom had a wonderfully whimsical feather light fixture, and a funky 1960’s bed. Our first response was to inject impact and focus into these rooms by the careful use of paint, wallpaper and art. 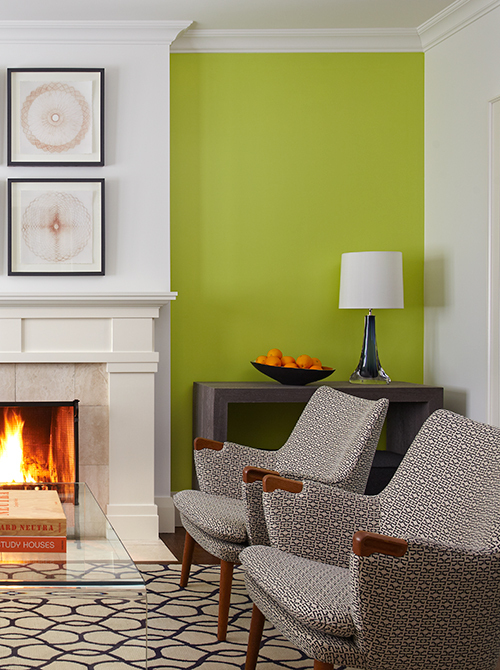 In the living room, a green accent paint colour created a much needed ‘wow’ factor, especially when layered behind a white bookcase and a textured console table on either side of the fireplace. A pair of original Hans Wegner 1950’s chairs were upholstered in a patterned modern fabric, while a modern area carpet grounded the room. A contemporary styled sofa was sourced and given ‘pinstripe’ fabric cushions. The final result was a stunningly simple but hugely impactful room. 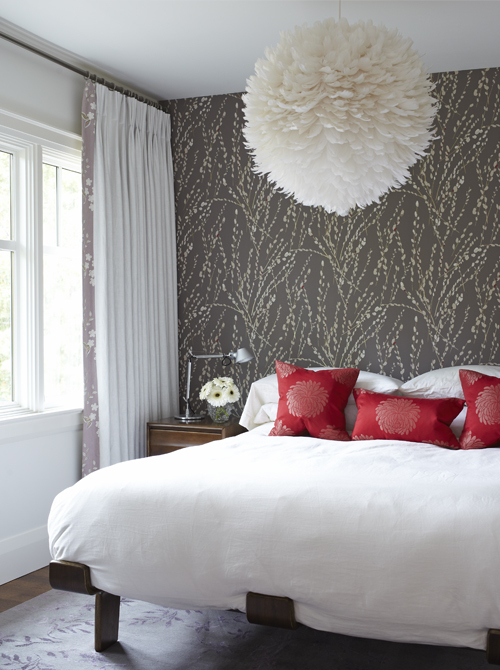 The same approach was taken for the master bedroom – a feature wall with a beautiful neutral wallpaper created an organic theme which was continued through the choice of the area rug, the drapery and the red “dahlia” cushions. Finally, in the dining room, drama and impact were created by the addition of orange molded plastic dining chairs and wonderful oversized wine posters collected by the client. The result – a hip, eclectic and energetic update to bring a stalled renovation to a successful and satisfying completion.